Tim Fleischer has an update on a subway accident in Brooklyn that killed an MTA worker. WINDSOR TERRACE, Brooklyn (WABC) -- Two MTA subway workers were struck, one fatally, by a G train in Windsor Terrace, Brooklyn, early Thursday morning. 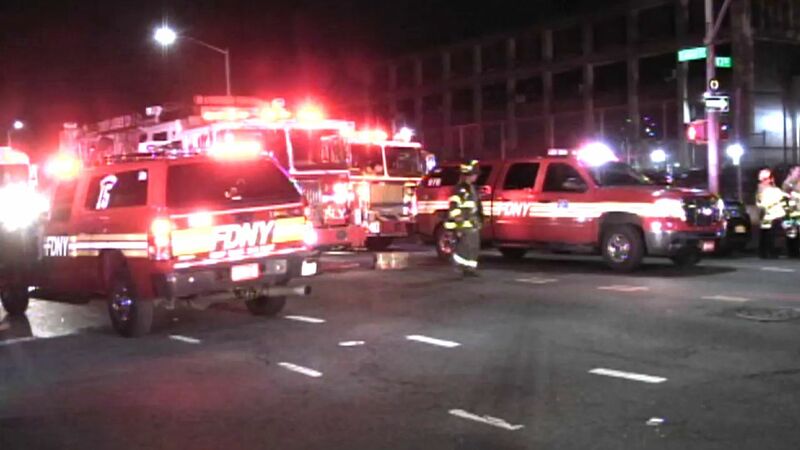 The workers were hit while preparing the southbound G train track for overnight construction just after midnight. They were on a curved section of underground track between the Fort Hamilton Parkway and Church Street stations. Lewis Gray, 53, died from his injuries. The second man, Jeffrey Flemming, suffered serious injuries. "The vision of the train operator was obscured, and the line of vision of the workers was obscured," TWU Local 100 President John Samuelsen said. "And that was the perfect storm that caused this accident." Samuelsen talked with workers in the electronic maintenance division at crew quarters later in the morning, telling them to "go home in one piece to your family." He said the conductors were "flagging," or setting up lights and a safe zone, below the shaft way for a construction project, when the men were struck. They were pulled from an escape hatch and rushed to hospitals. "All safety standards are being reviewed with employees and a 'safety stand down' order requiring all non-emergency track work to cease has been issued while an investigation is underway," New York City Transit President Ronnie Hakim said in a statement. Rail service resumed a short time later, with some riders just hearing about the accident. "That's tragic news," one straphanger said. "Love to the family. I have nothing else to say. Obviously they need to address some issues." This is the 13th fatality among transit workers in the past 15 years and highlights, union officials claim, the dangers of this type of work. "That does routine maintenance and construction under live train traffic and around energized third rails," he said. "We deal with that every night, and it's a testament to the professionalism of our union that more fatalities don't occur." The NTSB is sending investigators from it's rail safety team to look into the accident.